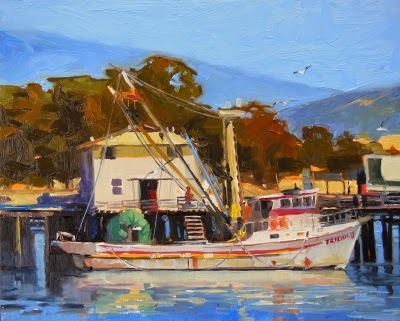 I will conclude my California paintings from the third annual Plein Air Convention with this commission painting that I did from a photo taken on location in Monterey. Thanks for hanging in there with me~! 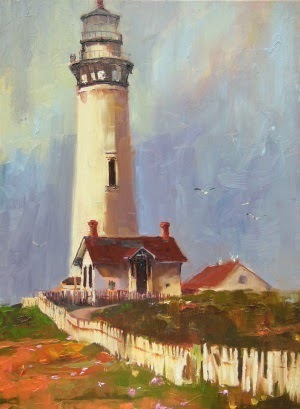 In the afternoon Maury and I headed down the beach to paint the lighthouse from a different perspective. Mo painting at Pigeon Pt. 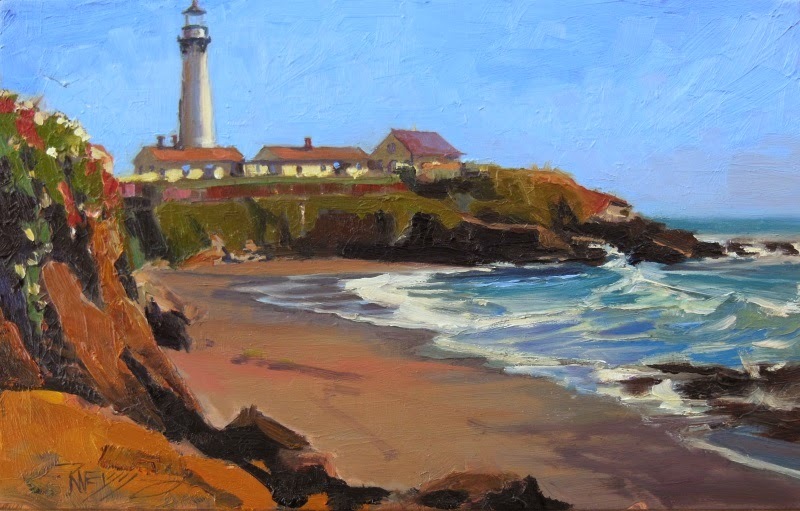 The Pigeon Point lighthouse was built in 1871 to guide ships up the Pacific Coast. It remains the tallest lighthouse on the west coast. After we had our fill of the lighthouse and the California coast, Maury and I headed inland to see the great Redwoods.. After a long day of painting we camped at a spot not far from PP . It was a nice break to get some laundry done and visit with a new friend Tony Barros at the Costanoa KOA campground. One of the nicest KOA's I have ever stayed at! Next morning after I tried a quick painting we headed towards San Jose to look for a mission to paint. 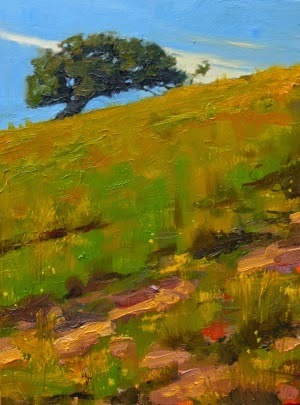 That didn't happen but we did find a spot off the road to paint the live oaks in a pasture off the road. 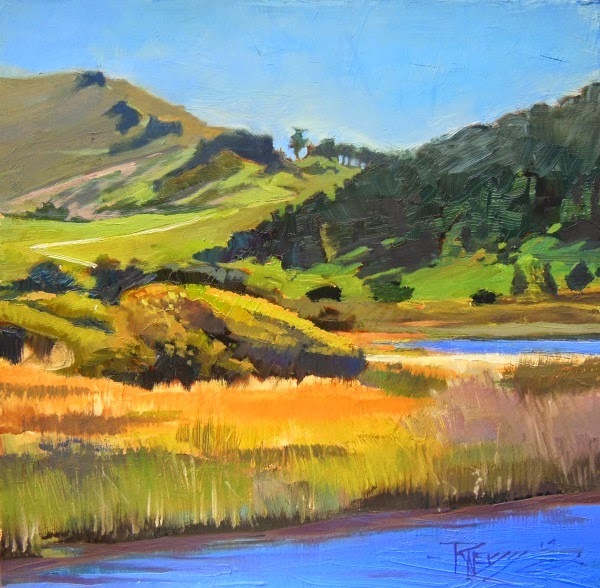 The next day Maury was headed home to Seattle from San Jose airport and our painting adventure together came to an end. My plan was to continue on to Yosemite National Park. By myself for the first time on this journey I was already missing my family but beautiful country and van breakdowns would keep me well distracted! 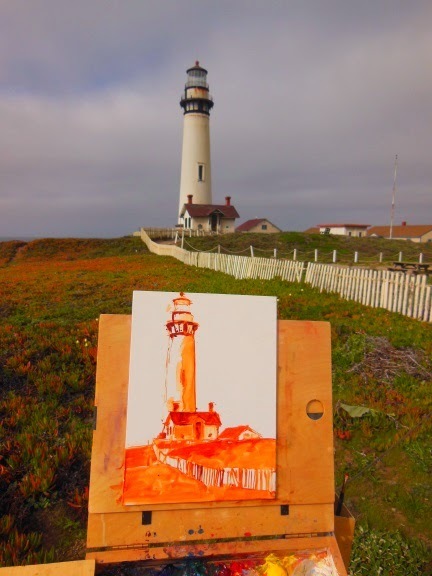 After painting Rocky Point, Maury and I headed for the hostel at Pigeon Point. It felt like being back on board ship staying in a dorm with a bunch of young kids again... but fun! In the morning Maury slept in and I went out to paint. 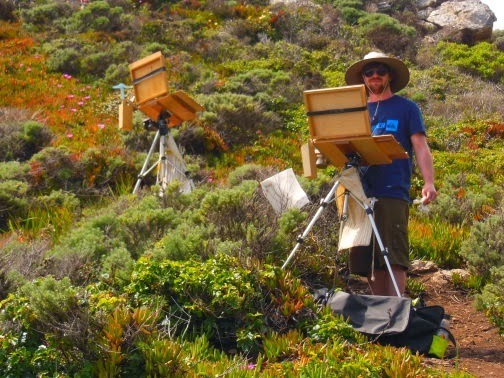 I started out with my usual reddish under painting working out value and composition. I had to take Maury back to the Rocky Point Restaurant. What a great spot! Afterwards we had a beer on the deck and watched the gray whales migrating up the coast.